Margaret K. McElderry Books, 9781481420891, 352pp. 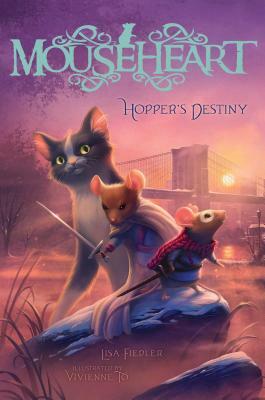 A brave mouse attempts to rebuild a fallen empire in this second book of the epic Mouseheart series set in the subway tunnels of Brooklyn, and for “fans of Erin Hunter, Brian Jacques, and Kathryn Lasky” (School Library Journal). The battle to free Titus's camps is over, and Hopper, Zucker, Firren, and their loyal followers are working to rebuild. But the tunnels are in a state of chaos, and without the sinister peace accord to protect the rodents, Queen Felina and her growing army of ferals is a greater threat than ever before. In the Mūs Village, Pinkie has led a coup and is now ruling with an iron paw. And Pup has become cold and defiant, a change that Hopper never saw coming. When exterminators raid the tunnels, Hopper is snatched away by the intruders and taken back up to the daylight world where he was born. Upland, Hopper makes new allies, and as he enjoys the sights and sounds of Brooklyn, he wonders if he will ever make it back into the tunnels to restore safety and prosperity, as foretold by La Rocha's prophecy. But why should Hopper fulfill a destiny he never wanted in the first place? In the first volume, the diminutive Hopper, a mouse escapee from a pet shop in Brooklyn, NY, finds himself among the denizens of a subterranean rat empire, Atlantia, searching for his lost siblings. The battle in the previous novel left the civilization in tatters and Hopper and his friends work tirelessly to rebuild. When the tiny mouse is taken “Upland” to the streets of Brooklyn once again, he must form new alliances and grapple with his own unique and challenging destiny. For ravenous readers of Erin Hunter, Brian Jacques, and Kathryn Lasky, this is a not-to-be-missed series. For ravenous readers of Erin Hunter, Brian Jacques, and Kathryn Lasky, this is a not-to-be-missed series.